For a moment, it looked to be the greatest game in Japanese soccer history. Up 2-0 against Belgium, Japan was looking at a first ever trip to the World Cup quarterfinals. But Belgium unleashed its world-class quality and ripped off three straight goals, the last coming in the dying seconds of regulation, to crush Japan’s hopes on Monday in Rostov-on-Don. The victory avoided a demoralizing defeat for Belgium’s so-called Golden Generation of players that has long promised a great performance at a major championship and now seems poised to deliver it, at least if it can get past mighty Brazil in the quarterfinal on Friday. 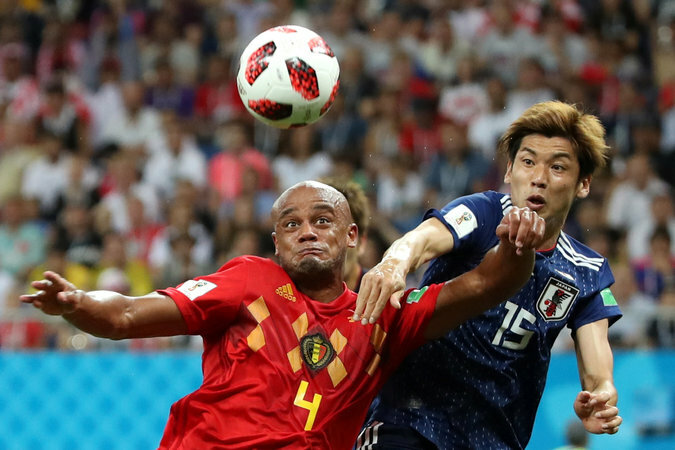 Belgium dominated the first half, but was frustrated time and again by Japan’s pesky defense, which always seemed to be in the right place to clear a pass or block a shot. But it was Japan that improbably jumped on the scoreboard three minutes into the second half. Jan Vertonghen badly missed a back pass, giving Genki Haraguchi a chance through on goal. He finished clinically, and Japan was in front. While the first goal came after an error, the second, four minutes later, was pure class. Japan passed the ball around with some skill, and it eventually found Takashi Inui at the top of the box. It didn’t look like a golden chance, but he turned and rifled it into the net. For 17 minutes, fans were contemplating a dramatic upset. But that’s when the fightback began. Vertonghen was far along the end line, but somehow headed it in from an impossible angle and distance. Five minutes later, Belgium was on level terms. Substitute Marouane Felliani leaped the highest for Eden Hazard’s inch-perfect cross and headed it home. To Japan’s credit, it did not back off and kept looking for a goal. But it was favored Belgium who finished off the game 94 minutes in. It was a comeback to remember for Belgium and a heartbreaking end to Japan’s nearly-famous day. • Sign up here to receive direct messages from our journalists on the ground at the World Cup in Russia. In the dying seconds, Belgium breaks and gets a 4 on 3. Thomas Meunier slides it across, Romelu Lukaku dummies the ball and it goes to Nacer Chadli, who strokes it in as Japan backpedals. What a comeback! Nacer Chadli sends it home after it’s tipped to him by Lukaku. Belgium has done it. The referee Malang Diedhiou calls Vincent Kompany for a trip, giving Japan a free kick. Witsel tries to clear a ball back for a corner, but it tips Osako, and Courtois is forced to make a diving save. That would have been a howler. Jan Vertonghen from distance and it’s another Kawashima save. Japan hanging on here. Nacer Chadli and Romelu Lukaku get consecutive in-close headers for Belgium and both draw strong saves from Eiji Kawashima. This game continues to be played at a fast pace. If it goes to extra time, fitness is going to be a real issue. Keisuke Honda, the new sub, races onto a through ball, and it’s dangerous! But his shot goes wide, and maybe should have been a little better. Here comes Keisuke Honda for Japan. Another goal-scoring threat in the game. Hotaru Yamaguchi will also check in. Chadli’s cross looks good, but Lukaku can’t get the full head to it and it’s wide. Belgium is playing with confidence, understandably. Both sides pressing to make it 3-2. A welcome change from some of the cautious play we’ve seen in the World Cup. Belgium have fought back! Marouane Felliani leaps highest for Hazard’s inch-perfect cross and heads it home. Great substitution. This is the rampant Belgium we expected! Belgium feeling it now as Alderweireld stumps a shot just in front of net wide. Yuto Nagatomo’s cross is a little short and Belgium clears it away. The ensuing corner is also short. What a header from Vertonghen! He was near the end line and somehow belted it in from an impossible angle and distance. The game is back in the balance! A corner for Japan. Gaku Shibasaki can’t find any of his teammates and sends it in short. Belgium will see if Marouane Felliani can change things. He checks in for Mertens, and Chadli comes in for an ineffective Carrasco. Sakai crosses, and Haraguchi lunges for it. That could have been 3-0, but his header goes wide. Thomas Meunier puts a nice cross on Romelu Lukaku’s head and it looks as if we might have a goal for Belgium. But no! It’s just wide. Japan’s defense has not yet showed any signs of slowing. Belgium is still finding a forest of legs to get through, and Lukaku is still not seeing much of the ball. Gaku Shibasaki takes the corner but sends it right to Belgium’s waiting feet. Yuya Osako sends a cross into the box, but Belgium scrambles to clear. Corner coming for Japan. Japan’s first goal may have come off a mistake, but the second was a beauty — a seeing-eye scorcher from 25 yards that was unstoppable. Two goals is a deep hole with half an hour to play. Now it’s Carrasco’s turn to shoot, but he sends it way over the bar. Thomas Meunier tries to chip one into the box but he sends it long. Belgium is pressing now, understandably. Japan passes the ball around with some skill and it eventually finds Takashi Inui at the top of the box. It doesn’t look like a golden chance, but darned if he doesn’t turn and rifle past a diving Courtois! 2-0 Japan! A shock result is on the cards here. Eden Hazard almost equalizes! He hammered a shot and it caromed off the post! Belgium is up for a comeback here. It came through a mistake all right, Vertonghen badly missed a back pass and that put Haraguchi through on goal. He finished clinically and improbably, Japan is in front! Belgium will be looking to do better at getting the ball to Romelu Lukaku. We’ll see how long Japan’s defense can keep up the escape act. Next up for the winner of this game: Brazil. On the evidence so far, either of these sides will have a problem in that game. That was Belgium’s half, statistically. But here’s the stat that tops them all: Japan had 26 clearances in the half — 26! to Belgium’s 5. Romelu Lukaku brings down a ball just outside the box and taps it to Dries Mertens, who fires one to the right corner. Eiji Kawashima dives and makes the catch. Another chance spoiled by the stout Japan defense. Japan counters and shuffles a ball toward goal. It rolls through Osako’s legs, but Courtois spills the easy save, only to pounce on the ball as it rolls to the net. Again, Japan’s best bet to score is through a Belgian error. Belgium in the box. One pass, two passes. But again the third pass, the one bound for Lukaku, is blocked by Japan, and the threat ends. It’s true that Japan is playing a lot of men back on defense. But full credit: Those men are playing well, always seeming to be in the right place to block a shot or clear the ball. First yellow of the game to Gaku Shibasaki for a trip. Belgium’s fifth corner (to Japan’s 0) leads to some headers but no shots. Belgium again, with numbers. Eden Hazard’s shot is blocked, then Witsel’s blast off the rebound goes way over. Japan is controlling more of the ball the last few minutes, though its attacks are less ambitious than Belgium’s: kick a long ball and hope for a Belgium error. But goals like that count, too. A good spell of Japanese possession, though mostly at midfield. It ends when Meunier misses a header and Japan suddenly has the ball by the goal. Inui smashes a good header, but the Belgian goalkeeper Courtois is up to the task. A foul by Thomas Meunier ends Belgium’s attack. The Belgians have been in complete control for at least 10 minutes, finding a roaming Lukaku in and around the box. Belgium whips it around the area, but once again the last ball, from Mertens to Lukaku, is errant and Eiji Kawashima is able to jump on it. Lukaku gets the ball in front of net but can’t quite get a boot on it as Kawashima hampers him. Closest call yet. It’s all Belgium right now. Belgium is spending a lot of time in Japan’s end, but not a lot in the danger zone. Japan is hustling on defense and making clearances (8 so far to Belgium’s 3). Lukaku fires a shot from the half moon, but it goes high. He was perhaps hampered by a slide tackle by Nagatomo. Japan has its hands full with the Manchester United striker. Belgium is starting to put things together. Romelu Lukaku brings down a cross from Thomas Meunier inside the box but can’t get a good boot on it. His shot is deflected wide for another corner. Kevin de Bruyne on the corner, give-and-go with Eden Hazard and then a chip to Kompany. That’s textbook Belgium, but Japan clears. A long run by Hazard leads to Carrasco getting the ball in the area, almost being brought down, but sticking with it and firing a shot that is blocked. Kevin de Bruyne flips one into the box for Belgium, and Mertens has his man beaten, but is a half-step too slow to get his boot on it. Japan comes right back and makes some noise. Gen Shoji finds some space and decides to go for it. His shot is way over the bar. For the first time, Belgium gets an almost-chance. Carrasco and Mertens were in the middle of it, and Lukaku had a quick touch that probably frightened Japan fans. But it’s cleared before a shot can be fired. Hiroki Sakai has been an active presence on Japan’s right wing, stealing a pass, then later muscling a Belgian player off the ball. He gets knocked down by Kevin de Bruyne for his trouble. Belgium gets a free kick after Makoto Hasebe tackles a little too roughly. Whistle blows. A poor clearance by Belgium leads to the first shot by Japan. Kagawa gets it just outside the box and sends it wide. Japan’s offense is definitely more potent with this lineup. Here we go. Japan in blue, Belgium in red. Belgium kicks off, passes it back and there’s a quick early touch for Vincent Kompany, who looks unimpeded by his injury. The referee for today’s contest is Mr. Diedhiou of Senegal. 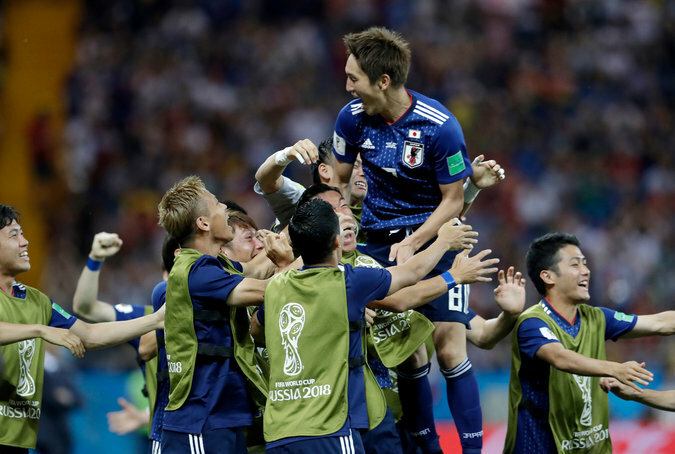 Japan’s four goals in this World Cup come from four different scorers: Kagawa, Osako, Inui and Keisuke Honda. Curiously, none of the four were in the starting lineup for the final group game against Poland, perhaps a reason the team failed to score. Today, Kagawa, Osako and Inui are back in the starting lineup and Honda is on the bench, but would be expected to come in at some point.